The Flatlock Long-Sleeve Springsuit is a popular style, covering the arms and torso. The flexibility and freedom of movement of this one piece suit is perfect for warmer conditions. 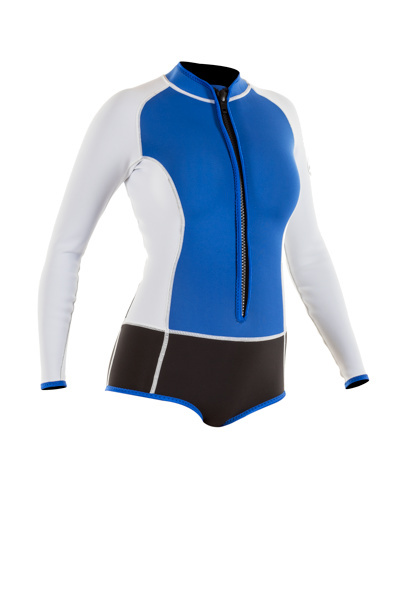 The suit is made with Neospan for more flexibility and can be made with Smoothie neoprene on the front and back panels to help you stay warmer in windy conditions. This suit has non-corrosive Vislon zipper with interior flaps to prevent water from entering. All seams are flatlocked. This suit is custom-fit to your measurements for maximum warmth and comfort. All JMJ wetsuits are made to last and keep you warm for years to come.